There is nothing that I have ever seen that matches the light show in the floor of the Grand Canyon at sunrise. 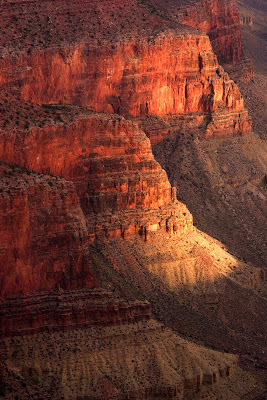 In a matter of moments, the canyon goes from total blackness to a spectacular display of light and shadow. Once it gets started, it changes so rapidly that it is hard to keep up. On this morning, I would often find a compelling subject and establish my composition, only to see the light move to another place before I could capture the scene. But when one door closed, two more would open, and there was no shortage of great shots. Here the repeated diagonal patterns of the eroded buttes is broken up by the uneven lighting of the morning sun. Canon 20D f/22 0.4 sec. ISO 100 28-200mm lens @100mm To see a larger version of this photograph, click here.